In late 2003 as the war in Iraq shifted from armored combat to fighting a growing insurgency on the ground, Soldiers found themselves increasingly in danger as they moved about in soft-skinned Humvees. Never intended for front-line combat, the M998 High Mobility Multipurpose Wheeled Vehicle (HMMWV or “Humvee”) provided virtually no protection from small arms fire or from the expanding use of improvised explosive devices (IED). In response, units began adding protection of their own, placing sandbags on their floorboards and welding on a creative variety of steel plating to the sides of vehicles utilizing whatever was on hand. 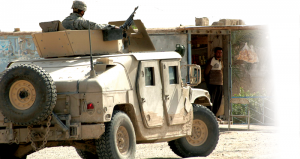 Such temporary expediencies became known as “haji armor” or “hillbilly armor” and were intended to bridge the gap until the Army could provide better armor options and increase the number of armored Humvees in Iraq. 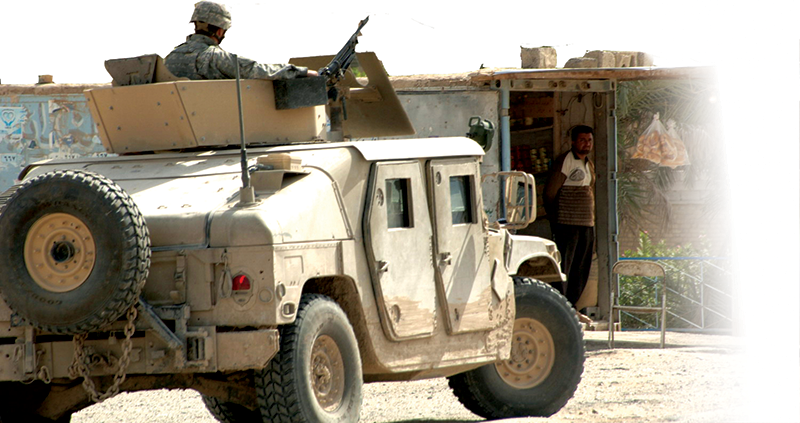 A soldier from 1st Battalion, 68th Armor on an armored HMMWV takes up a security position on Nahrwan’s city streets as a local shop owner looks on. 2006. U.S. Army Photo. Visitors to the National Museum of the United States Army will see examples of the Army’s first attempts to provide this needed additional protection. Within the Uncertain Battlefield gallery, three Humvee doors from an Armor Survivability Kit (ASK) will be on display, helping to document this dangerous shift in the war. In late 2003, the Armor Survivability Kit was quickly developed at the Army Research Laboratory in Adelphi, Md., and field tested at the Aberdeen Proving Ground, moving from design to production in just six weeks. The ASK included a bulletproof windshield, armored seatbacks, and a set of replacement armored Humvee doors with small windows of bulletproof glass that could be retrofitted in the field. This was an important precursor to the Fragmentary Armor or Frag Kits introduced in 2004. 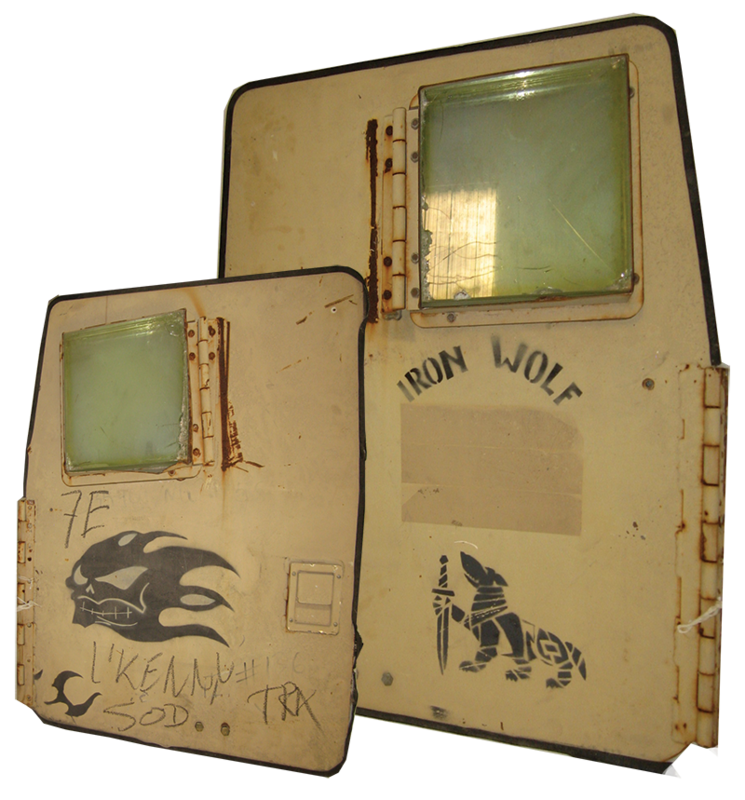 Each of the three armored doors bear their own unique artwork, created with cut stencils and spray paint. Comparing them to the iconic bomber nose art of World War II, Semancik noted that these emblems helped Soldiers personalize their vehicles. Amid security concerns that insurgents could use such markings to identify and track the movements of particular vehicles, commanders ultimately ordered these emblems to be removed. These surviving Humvee doors therefore represent a snapshot in time as the Army learned and adapted to the ever-changing situation in Iraq. The exhibits at the National Army Museum, extending from the Army’s formation to modern operations, will offer visitors the opportunity to interact with real objects and help connect them to real Soldiers and their experiences. “One day, I want veterans who are walking through the Museum’s exhibits to see and recognize these Humvee doors and to tell their families about what they remember,” Semancik explained.